With sporadic snowfall and temperatures bouncing all over the place, it’s safe to say that Winter 2019 has presented us snow-lovers with something of a challenge to date (for ‘challenge’, please read ‘enormous frustration and relentless weeping’). Despite the fact that it’s been a bit of a famine with the odd spoonful of snowflake shaped gruel to keep us interested, there have still been some decent days out in the mountains both at home here in Scotland and further afield in the Alps and the Dolomites. Gear testing opportunities may have been shorter and further apart than we would have liked this season but they've been oh-so-sweet as a result. 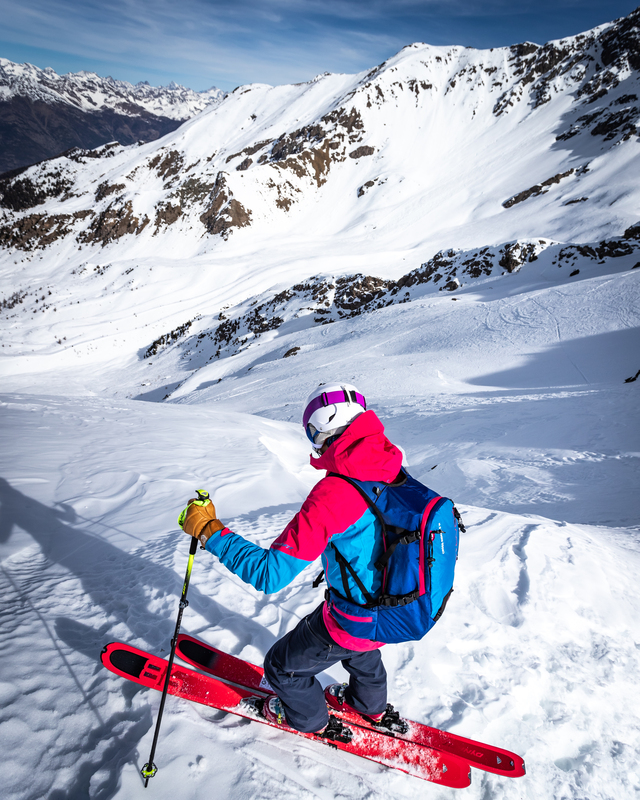 If you’re looking for a freeride quiver of one for day tours and off piste adventures then the Dynafit Beast 98W is an all-round ripper of a ride. Don’t let the name intimidate you – the Beast is more of a Labrador. A capable, reliable and accessible ski that genuinely wants to do well for you. Weighing in at 1,400g (170cm) with a 98mm platform underfoot, it’s light enough to perform on the uphill but really delivers on the descent. If your priority is to enjoy the turns you’ve earned, then the Beast 98 W could well be the ski for you. We’ve skied the Beast 98 W over the past couple of winters across the full spectrum of conditions from spring snow to deep powder, crud to chop, narrow chutes to wide groomed pistes and have been seriously impressed by it’s ability to adapt and perform. With full ABS sidewalls and an ash-poplar wood core, the Beast 98 W is light yet will deliver stability and edge hold when you need it. As long as you’re in charge of the ski, the Beast 98 W will handle the rest. An impressive all-rounder from a brand with genuine backcountry heritage. BEST FOR – ADVANCED SKIERS LOOKING FOR AN ALL-ROUND RIG FOR FREERIDE TOURING, OFF-PISTE AND OCCASIONAL RESORT DAYS. Having spent a decade wearing only lightweight, soft flex touring boots, I wondered whether the burly looking and catchily-named Salomon QST Pro 110 TR W - a ‘normal’ alpine boot - would be too stiff, uncomfortable and really difficult to get on and off? We all know that new boots can be a bloody nightmare but the QST Pro 110’s have been well-behaved and extremely comfortable from the get-go. No torturous wear-in period with arch ache, toe pain, loss of circulation and freezing feet here – hell no. Weighing in at just 1.6kg, the QST Pro 110’s are surprisingly light for such a solid looking boot. The 100-106mm last is ‘average’ and works fine for my narrow low volume feet thanks to the comfortable CustomFit 3D Pro Liner. The Endofit Tongue means they’re easy to pull on and remove at the end of the day and the women’s-specific calf shape also works for my non- women’s specific-shaped lower limbs! 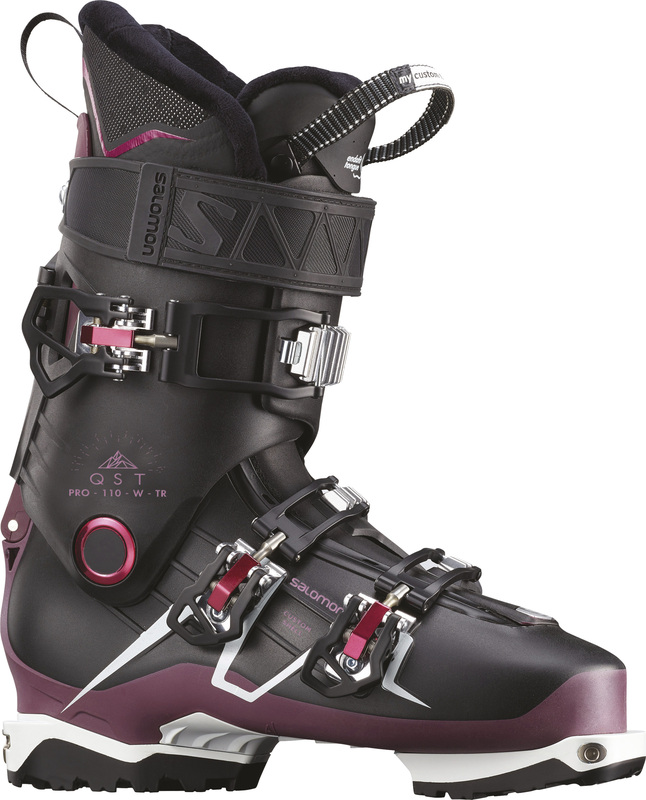 BEST FOR – INTERMEDIATE TO ADVANCED SKIERS LOOKING FOR A COMFORTABLE BOOT THAT’S STIFF ENOUGH TO REALLY DRIVE THE SKI. Having admired German company Ortovox’s impressive-looking ski outerwear for several years, we finally got the chance to try some of the kit this winter. The outfit we were offered to test was the Guardian 3L Jacket and Pants – a high-end women’s-specific outfit that’s equal parts rugged and super-stylish. As soon as you lay hands on this kit you can feel the quality and durability. The inside of the jacket and pants are made entirely of merino wool which means they’re super warm, breathable and feel really good next to your skin. The outside is constructed using a high performance stretchy, waterproof and windproof material that keeps the elements where they belong. 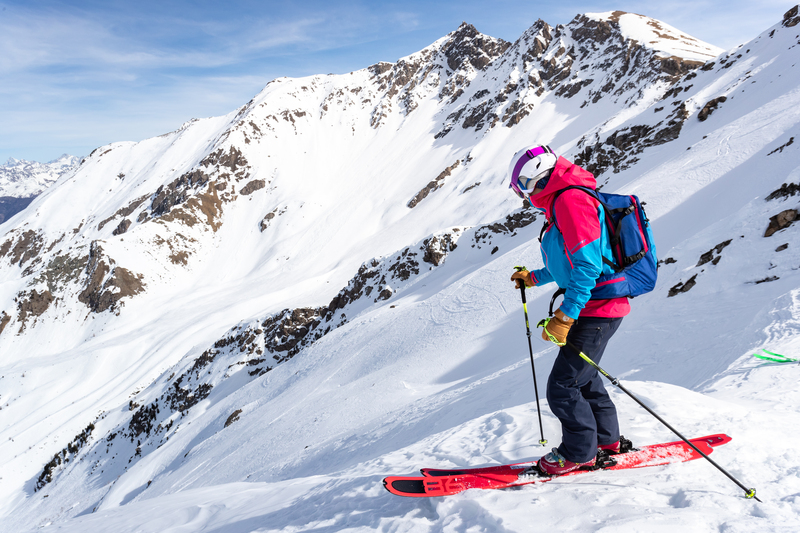 With numerous technical features such as pit zips, powder skirt, integrated gaiters and multiple pockets for storage, the loose fitting Guardian 3L jacket and pants are ideal for stormy lift-accessed powder days and hike and ride adventures. BEST FOR – HARD CHARGING FEMALES LOOKING FOR COSY YET STURDY, LOOSE FITTING KIT FOR FREERIDE ADVENTURES AND COLD WEATHER TOURING. British brand Sungod have injected a much needed breath of fresh air into the eyewear industry with their top quality customizable ski goggles and sunglasses that real people can afford. This was my first time trying any of Sungod’s products and I’ve been totally converted to their fun, creative and functional approach. The process of designing the goggles online was straightforward (although choosing between 15 different straps, 3 frames and 6 4KO lenses was tough as pretty much all the combinations looked awesome!) and delivery was swift (and free). 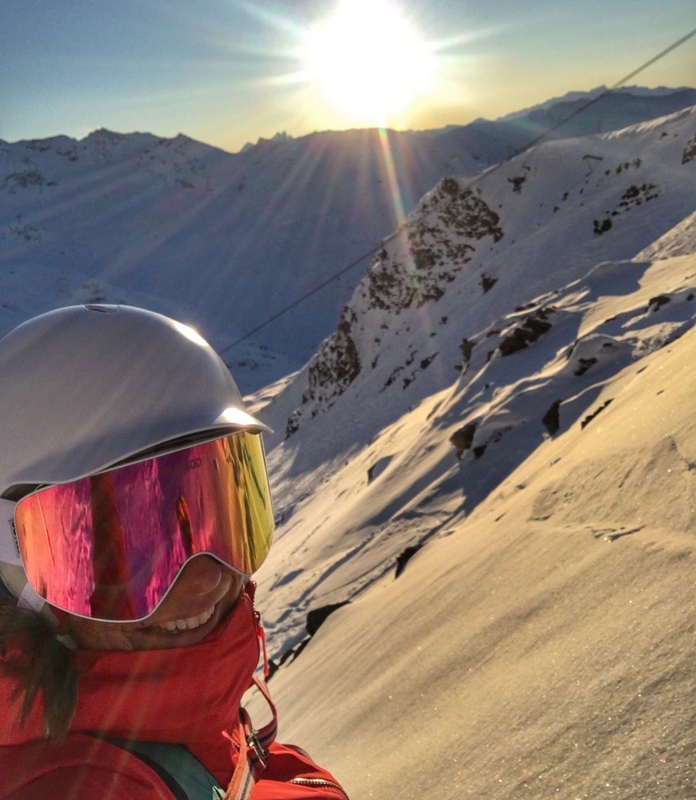 I put them to the test on a sneaky pre Christmas weekend in Val Thorens and found the 4KO High-Vis Pink interchangeable lens provided excellent definition in lower light but still offered adequate contrast and protection in brighter conditions. The field of vision was notable but I was most impressed by the zero fogging I experienced with the Vanguards - a massive result considering that I was hooning around the mountain desperately trying to keep up with a local freerider. In terms of fit, the Vanguards are ‘unisex’ in the truest sense of the word - ie they’re on the medium-to-large end of the goggle spectrum – so they should work for all but the most teensy of faces. The only feature I would like to see added would be a clip in the strap itself as I find this makes taking goggles on and off much easier – particularly when wearing a beanie. I’ve tested the Chickadees over the course of some super chilly days at altitude in the Alps. Facing the prospect of seriously sub zero temperatures, an icy wind up high and a weak winter sun, I feared for my feet on long chairlift rides but I needn’t have been concerned. What the Chickadees pack in vibrant looks and personality they’re more than capable of backing up in performance. Well thought-out features such as the awesomely-named Toe Box oven kept these socks feeling toasty all-day long and the engineered arch support was both noticeable and appreciated by my injury-prone flat trotters. I wore them on consecutive days and they didn’t honk (despite not being constructed using Merino wool – the holy grail of stink-free fabrics that results in a far more expensive sock) and they came out of a 40 degree wash looking way better than they went in. Result. 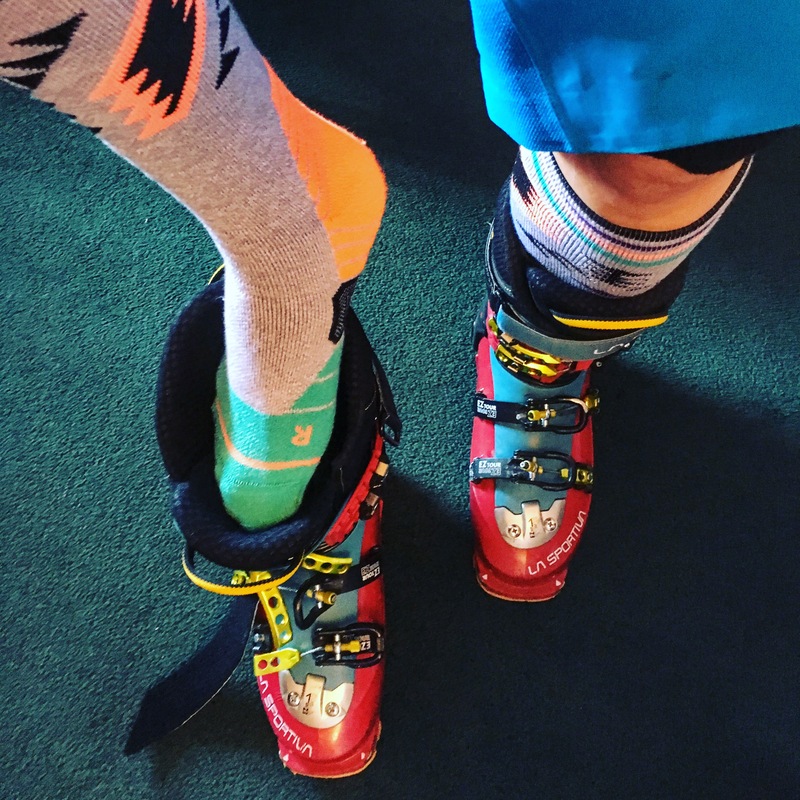 BEST FOR – FOLKS LOOKING FOR A FUN AND TOTALLY FUNCTIONAL ALTERNATIVE TO THE SAME-OLD, SAME-OLD ‘SERIOUS SOCKS FOR SERIOUS SKIERS' VIBE. WE'VE ALSO BEEN TESTING ALL THE NEW SHINY GEAR FOR NEXT SEASON SO LOOK OUT FOR WINTER 2020 PREVIEW - COMING SOON!